I began my slow transition from relaxed to natural hair a little over 6 years ago. I started getting perms around age 12, but still had healthy shoulder length hair. I begged my mom for years to let me relax my hair - like many black women, I thought chemicals were the only way for me to get manageable hair. After much convincing from a hairstylist auntie, I stopped getting perms and wore my hair in salon set perm rod sets for almost two years while my stylist cut off the chemically treated hair each visit inch by inch for almost two years. 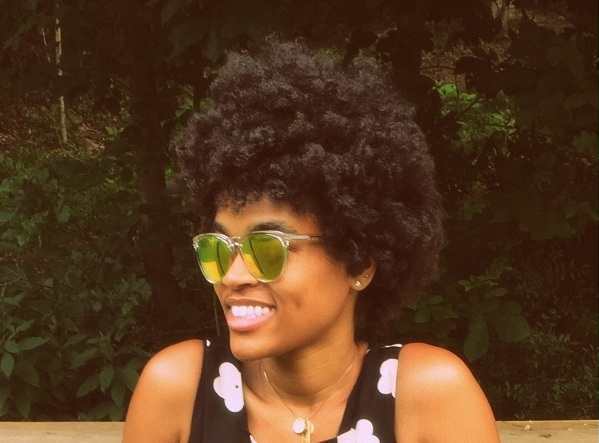 Once the transition was complete, I found it easier (and exciting) to do my own hair and find homemade remedies and product options to keep it healthy. A major part of this health for me is avoiding heat. Now I know a ton of naturals who use heat and have very healthy strands - it is a personal choice to have my hair as unaltered as possible. The journey to loving myself, and celebrating the parts of me that were not celebrated by everyone else has been a long and amazing one. Wearing my hair as close to how it grows out of my head is my personal revolution against all of the doubt, against all of the times I heard that I didn't have "the type of hair" to go natural. Black girl magic is very real and every step we take to clap for ourselves and all of the characteristics that are uniquely ours, the more fulfilling the natural hair journey can be. I very rarely use a comb or brush on my hair. As I have mentioned before, I do overnight styling - which means I do things to my hair the night before that will give me (fingers crossed) the desired results in the morning. Most nights I section my hair in to 10 parts coming out from the middle (or crown) of my head. I then spray water on each section and use my fingers to detangle the curls from the day. This eliminates shedding and allows for your hair to gently untangle instead of being yanked out by the comb. Just take your four fingers and go through the section horizontally, then vertically until your fingers glide through without much snagging. Because I don't use heat, I need all of the stretching I can get to retain length after adding water to my hair. So instead of just rolling my hair at night with curlers, I flat twist each section after detangling and adding my butter/oil to seal in the moisture. I don't use any holding product because I want my curls to be loose and light - but if you like, this is the perfect time to use a curling smoothie or custard that will help your hair hold shape while it dries. Check out a super easy-to-follow tutorial on how to flat twist here. It is easy for your curls to feel flat after being twisted down to your scalp and smashed under a silk scarf/bonnet overnight. While I am flat twisting sections, I like to take the middle section of my hair and do two separate twists going horizontal down to my ears. The rest of your flat twists will be twisted towards your forehead, or towards the back of your neck, in order to get the halo fullness of your curls. Doing this middle section in a different direction will add some volume to the middle to make sure you afro isn't flat at the crown of your head. I should own stock in flexirods with the amount that I own. As your hair grows, it becomes necessary to buy larger or smaller sizes to accommodate your growing locs. After I flat twist a section, I spiral it around a flexirod and twist the ends together so it looks like a pretzel. I use smaller flexirods in the back to get a tighter hair on shorter hair. You made it to the morning! And this is the fun part - after you have parted, sprayed, detangled, sealed with butter/oil, twisted, flexiroded, silk scarfed, and slept - you can finally get to the glam results. I take out each section by unwinding the rod in the opposite direction than I wound the night before. Then I make sure my hands are super dry and gently untwist my flat twists. Try to avoid doing too much pulling or rubbing on your curled ends, but lightly separate curls until you can no longer see the sections. Once your curls are separated, give yourself a gentle scalp massage (fingers only! No finger nails). Just rub the scalp to puff up the roots, and eliminate any parts. Then step out, slay and glow girl!